If y'all knew my BETTER half, you'd simply say, "you've been hanging around Robert too long"!!! Well, that is what "I" tell everyone!!! He and I have this thing for "playing" with words and I must say that it comes naturally to the both of us. We not only finish each other's sentences, we also completely speak the other's thoughts! I think this is part of the reason why we "clicked" nearly seven years ago! Now, I am NOT saying that everything is ALWAYS "hunky-dory", but for the MOST part, we communicate EXTREMELY well, which in my book, is VERY important!!! After all, "Men are from Mars and Women are from Venus", right??? LOL! My mama sent that book to me years ago while she was still living in Hawai'i (funny as most of you know, Robert is half-Hawaiian) and I read it from cover-to-cover at a much needed time. I had to laugh heartily when I read about how men retreat to their "caves". BOY, do they EVER!!! I used to have to go down to the "cave" after about three days of seclusion to make sure he was still alive!!! When we met, Robert was still recovering from the loss of a 22-year marriage that literally shook his world and pulled the carpet right out from underneath him. It is SO amazing how we are put into people's lives and they are put into ours for such a specific purpose and sometimes for only a brief time, while others, for a lifetime. I, too, had come out of a 22-year marriage, however, I had already had seven years to spend time getting to know "me" and I had actually grieved the loss of my marriage before my divorce was final. I also had six WONDERFUL children to look after - they were a TREMENDOUS help to my remaining strong and not faltering (not horrifically anyhoo!). OMGosh ... this is crazy! Isn't it WILD how sometimes one little thing can spark something BIG? I had intended to drop the goods and run .... right to my bed and jump in!!! ROFL! Tonight, I am leaving y'all with a couple of GLITTER-EDGED tags, strings and some goodies for y'all to decorate! Over the next few days, I shall add some more tags and items to decorate them with. Please feel free to give me some suggestions as to what you might like to see. If I am able to oblige, I shall be MORE than happy to do so! Night, night ... sweet dreams and what is tomorrow??? FANTABULOUS FREEBIE FRIDAY!!! Have a GREAT day y'all! All that GLITTERS here this week is either GOLD or SILVER!!! Thank you SO much for sharing your GLITTER stories with me and ALL of your SWEET comments!!! I am SO tickled that y'all LOVE "glitz" as much as me!!! While I was making a big fuss over the ease of DIGITAL glittering, I will admit that I, too, LOVE to craft with REAL glitter!!! I'm hoping to make a few hybrid Christmas cards using .... GLITTER!!! Glitter pens are a lot of FUN as well! I made five birthday cards for a card swap on our 3Scrapateers site sometime during the first quarter of this year. It was A LOT of FUN and I got to mail mine to Canada!!! 3S has card swaps ongoing and covering all kinds of themes, including Mother's Day, weddings, birthdays, Valentine's Day and, of course, Christmas!!! Y'all might want to check the forum if you would enjoy making and receiving homemade greeting cards. Our Ms. Brenda ROCKS and has been working VERY hard learning all kinds of new techniques for her card making. They are BEAUTIFUL! Please let me know if you sign up for any of the swaps so that I can be sure to be on the lookout for your postings!!! This girl is off to bed early tonight ... ROFL ... well, early for the past few weeks anyhoo! Hope y'all had a FABULOUS day today, scrapped much and I wish you a TERRIFIC Thursday!!! LOL!!! Of course there is!!! Just look at the mess it makes and HOW LONG it takes to eliminate each little SPARKLE that lingers about the house for weeks, perhaps even years to come! Another PLUS for DIGITAL, eh??? I mean, it looks pretty and there is ABSOLUTELY no mess involved whatsoever for GLITTERING digitally!!! Back in the early 90's my oldest daughter and I used to make GLITTERED ornaments at Christmas time when I used to sell my crafts at shows and at a local store that, at that time, totally catered to homemade delights! I LOVED using PRISMA glitter as it is SO fine and SOOOOOO sparkly! Boy, did we ever make a mess even as hard as we tried to keep everything contained! So, as I sit here each day creating GLITTERED goodies, I relish in the fact that my "mess" is completely contained and there is NOT a sparkle to be found in my hair, on the floor or anywhere else but right HERE on my computer screen!!! Oh, and of course, on the paper I print it out on!!! ROFL! I'm SO glad that you are still ENJOYING the bits of HOLIDAY SPARKLE!!! I just might tire of it before y'all do and I'm a GLITTER-HOLIC!!! He, he .... I'll try to have the LOWER-CASE alpha for you tomorrow night in both sticker and non-sticker form!!! Have a WONDERFUL WEDNESDAY eveyone!!! PHEW!!! I MADE IT WITH A NON-STICKER HOLIDAY SPARKLE ALPHA AND THEN SOME!!! I'm sure most of you can agree (if you are close to my age) that we did not "talk" about things and we DEFINITELY did NOT have 1- 800 numbers to call if we were in peril! I am SO thankful for our "information age"!!! HEY, without it, we all wouldn't be here supporting each other, learning INCREDIBLE ways to preserve family history OR collecting "freebies", RIGHT? LOL! Anyhoo, it was such a blessing to have this PRECIOUS young lady talking SO freely to me and we were sharing EQUALLY in the conversation! I had really wanted to pursue a degree (PhD) in Psychology a few years ago, but soon came to the realization that I've been through SO much in my lifetime and I've been given an opportunity for the first time to do some things that I am REALLY passionate about. Gee ... bet you can't guess what a few of them might be!!! He, he ... I TRULY love people and have learned to be a GOOD listener (yes, quite a talker too! ), but I'd rather remain a "layman" (or is that, "lay-woman"???) and do what comes natural rather than it be a "job", KWIM? 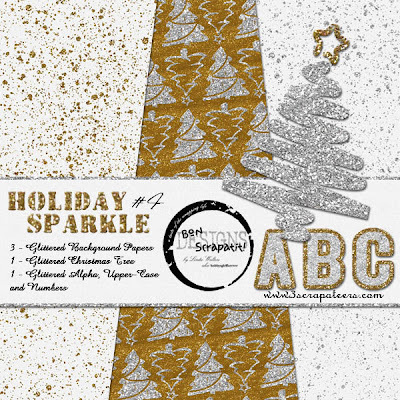 Okay, tonight I have bundled up the HOLIDAY SPARKLE alpha (upper-case and numbers) WITHOUT the transparent sticker for those who just aren't into the sticker scene! To be honest, I had a difficult time with them in the beginning, but they have finally found their way into my heart and into my designs!!! After all, I used to use A LOT of stickers when homeschooling my six babes!!! Ahhh YES, fond memories!!! Well, well ... needless to say, it is WAY past my bedtime and my DARLING Robert lays but a few feet away soundly sleeping. I am TRULY blessed and EVER thankful for having, at this time in my life, a partner who LOVES me for ME and supports my passions. Okay, I'd better leave you before the floodgates open up!!! I'm chuckling through the tears as I am enjoying my cup of life, OVERFLOWING!!! Thank y'all SO much for taking the time to leave some lovin'!!! I am OVERWHELMED at your LOVE for GLITZ, GLITTER, SPARKLE or whatever you prefer to call it!!! It's been a VERY long day and I did not get to add as much as I would have like to for tonight's FREEBIE. I shall try to be MORE creative in the next day or two!!! ROFL! I am trying to finish up a kit for Download-A-Day at 3Scrapateers! Hopefully, I shall make it back to post tomorrow night. I am REALLY enjoying the SPARKLE and it is tiding me over until we get our Christmas tree and I start to decorate for the holidays!!! I just LOVE the warmth and subtle elegance of white lights which help to reflect the SPARKLE of my gold and silver ornaments. Yes! I do use other colors besides silver and gold!!! I LOVE shades of wine, hunter green and a bit of blue in more of a "country" decor I suppose! I guess you could say that my home looks rather eclectic at this time of the year, however, it ALL seems to flow! I hope that everyone has had a FUN and SAFE Thanksgiving weekend and that tomorrow y'all will spend the day with your family and/or relaxing before your return to work on Monday. HAPPY FRIDAY everyone!!! Thank you for sharing a bit about your Thanksgiving day with me!!! I'm sitting here with tears in my eyes as I try to imagine sitting in with each one of you during your SPECIAL family gathering! Y'all are SO sweet!!! I'm SO glad that y'all had a memorable time and I hope to see some of your Thanksgiving scraps! NO, not your leftovers, your layouts!!! LOL! 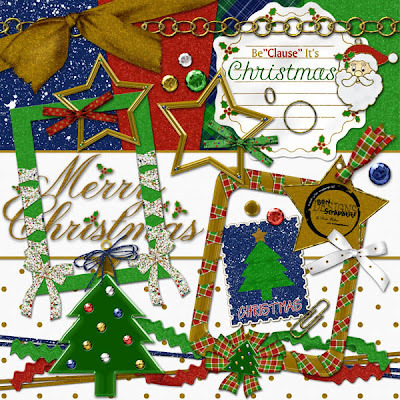 I mentioned several days ago that I was going to give you a SNEAK-PEEK at my contribution to the HUGE "Christmas Around The World" collaboration from designers ALL over the world that will be a FREE gift to ALL of our WONDERFUL fellow digi-scrappers EVERYWHERE!!! I am just SO excited about this!!! It is the first collaboration of this magnitude that I've ever been involved with to date and I am ALREADY looking forward to the next one! I will post ALL of the details as I acquire them. The ENTIRE kit will be ready for downloading on December 10th, so mark your calendars now and reserve some time to spend downloading ONE incredible MEGA, MEGA, MEGA, MEGA Christmas scrapkit!!! WOO HOO!!! I'm not missing a thing - God willing! My contribution to "Christmas Around The World"
HAPPY THANKSGIVING AND CHRISTMAS IS ON IT'S WAY!!! I hope that y'all have had your fill of turkey and all the trimmings, are ready for the after Thanksgiving sales and are preparing yourself for the season of "gift-giving"! I'm a little woozy at the moment and ready to crawl into bed. Robert and I DID stay home alone, which we were both glad for the more we thought about it! Six hours of driving would DEFINITELY have taken it's toll (no pun intended!) on both of us. We had a JOYFUL time together! I called my sister in Minnesota, my kiddos at their uncle's in Oregon and spoke with my youngest brother in Texas! I caught up with family while Robert went to the grocery store and purchased a "fresh" turkey (ours was in the freezer due to our ORIGINAL plans!) and the trimmings as he declared to me last night that he was going to cook dinner for me! SO sweet! YUM, YUM, YUMMY!!! My darlin' smoked the turkey in our Weber and it was DELISH!!! The best I've tasted to date and I've had turkey cooked several different ways over the years. The past two or three years Robert has "deep-fried" our turkeys, which naturally adds some calories, but hey, who's counting!!! I fixed up the trimmings. Everything was very tasty, however, the reason I am feeling so strange is that I am NOT used to eating in this manner and my body is rebelling! I shall have to be more careful as feeling like this is not worth the extra morsels of goodies!!! I'm sure that I would have been fine with the turkey, cranberry sauce and steamed veggies - it's the combination of the turkey, mashed potatoes and gravy that did me in!!! Ohhhhhh, but they were SOOOOOO good! Tomorrow will be my favorite as I always look forward to leftover turkey with cranberry sauce and a dab of mayo on toasted whole grain bread for lunch! I usually make my traditional "Berry-Mallow Yam Bake", but passed on it this time around. I'm sure that my daughters made it for their dinner at their uncle's!!! I don't cook much any more because of my own changes in eating habits and I'm sure y'all know how difficult it is to cook something that you cannot partake of on a regular basis!!! I'd LOVE to hear how y'all celebrated your Thanksgiving!!! Anyone go out for dinner? Fly out of state? Out of the country? Any FAVORITE traditional games y'all play together? I'm not sure if anyone ever noticed the word "UNO" on my background paper in *A Thank"fall" Heart*, but it just happened to fit in the scheme of things and is a game that I fondly remember us playing at my little brother's home before he moved to Texas!!! FUN times FOR SURE! Okay, I'm rambling and really need to put my lethargic self to bed and get a GOOD night's sleep so I can work on something SPECIAL for y'all for TOMORROW'S "Fantabulous Friday Freebie"! 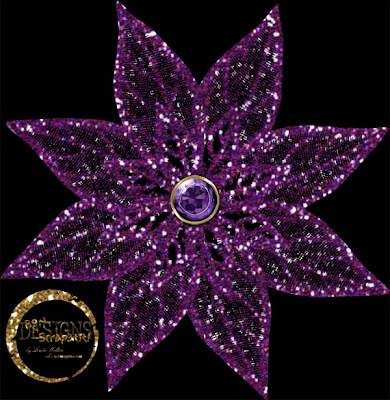 By request, I am leaving you with two more GLITTERED poinsettias in PURPLE and BLUE. 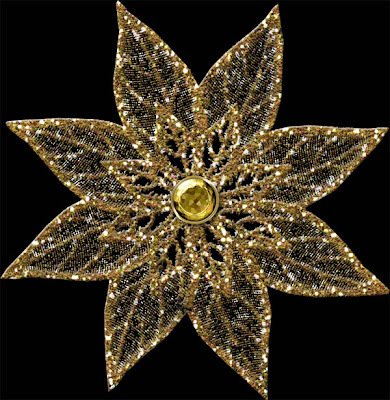 Again, you will find each one with and without a jeweled center. SWEET DREAMS everyone and have FUN shopping tomorrow and over the weekend to kick-off your holiday shopping!!! COME WINDOW SHOPPING WITH ME AND SOME MORE HOLIDAY GLITZ FOR Y'ALL!!! WOO HOO!!! Come join me for a little "window shopping" from the COMFORT of home! Look through the window! What do you see? TWO beautiful scrapkits for HALF-PRICE from me!!! I wish to express my continual "thankfulness" to y'all for your continued support of me! *IT'S FALLING! * and *A THANK"FALL" HEART* are both HALF-PRICE ($3.00) beginning TODAY, November 21st through Saturday, November 24th! Thank you for looking through the window with me! 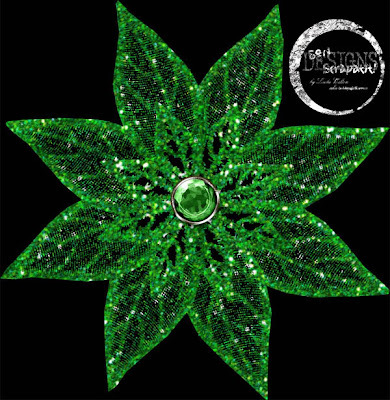 HAPPY THANKSGIVING to ALL who are celebrating and BON SCRAPATIT! P.S. 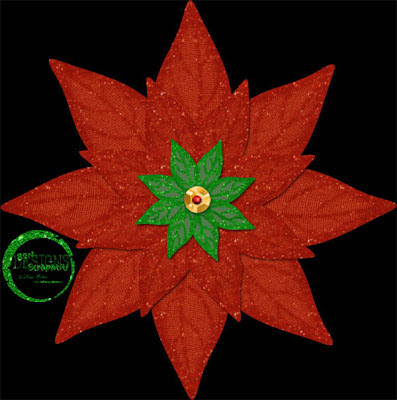 Continue on to receive your FREE gift for today: MORE glittered poinsettias!!! I noticed that one of you has requested a GLITTERED poinsettia in RED and I was already preparing to upload a couple!!! Was I on track, or what? While these are not quite the same as the silver and gold, they are special to me as they are the FIRST ones that I made while creating, "COLOR ME CHRISTMAS", which I've not added to this week. This will be THIS week's addition since I know that MANY of us are busy preparing for the holidays! I was rather skeptical about placing the "countdown to Christmas" on my blog, but I am SO glad that I have!!! Each day I log on, it helps me to remember just how little time I have left to get it in gear!!! ROFL! Is there a method to this madness? Oh, I'm quite sure there are several, but I don't think I'll be even close to finding one until next year .... maybe! I hope that you enjoy these and if you are liking the style of the first two better, not to worry, I shall make a few more just like the others. I'm thinking that rather than adding the gem, I will just leave them with a "glittered" center and that way you can add whatever embellishment you wish to or, not! What do y'all think??? Also, if there are any other colors you'd like to have for your collection, I 'd be more than happy to make some. Hmmm .... just had a thought .... I think what I shall do is offer each poinsettia with and without a center!!! Simplified! GOOD NEWS!!! And I almost forgot to tell you! Robert and I will be spending Thanksgiving with his siblings after all! Not only did he stay longer at the birthday party, but he was quickly talked into attending the SPECIAL family gathering!!! WOO HOO!!! Thank you for your well-wishes in Robert and I enjoying a "quiet" holiday together this year. I was actually at peace with the prospect! The boys just left for Oregon a few hours ago and it is SO quiet in the house, you can actually hear my computer!!! ROFL! Robert works tomorrow and we will be driving to his brother's home to spend time with him, his wife and their father (this is the same home we attended the birthday party at), spend the night there and then all leave for another brother's home for Thanksgiving dinner. I really cannot express to you just HOW much I LOVE gathering with Robert's family (LOL!!! - okay, they are now MY family too). Their mama filled them all with a TREMENDOUS amount of "aloha" when raising them. I just ALWAYS have such a GOOD time! Gosh, I do babble on so don't I? LOL! Thanks again for stopping by and leaving some love! To those of you traveling, I wish you SAFE travels. I shall try to make an early post tomorrow before we leave as we will not return home until Thursday night. WHAT DAY IS IT??? WOO HOO - IT'S FANTABULOUS FREEBIE FRIDAY Y"ALL!!! HAPPY FRIDAY y'all!!! This is going to be a DRIVE-BY "freebie" drop of sorts as I've just got to get my BEAUTY sleep for the BIG family get-together tomorrow!!! He, he ... this means some SERIOUS hours!!! 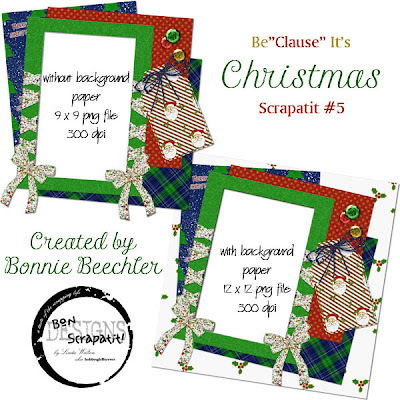 Tonight, I leave you with another GORGEOUS "scrapatit" creation by Ms. Bonnie using my *Be'Clause It's Christmas* scrapkit!!! She is just THE BEST! I LOVE her LAYERS and she is REALLY good at the BLING-THING!!! Thank you again Bonnie - you are SO generous to share your time and your talent with ALL of us! 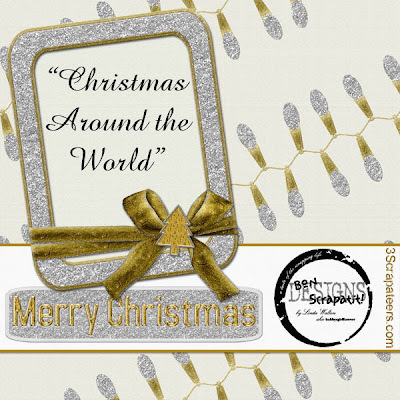 I am in the midst of working on a collaboration for "CHRISTMAS AROUND THE WORLD", which will feature designs by TONS of designers from ALL over the world and will be available as FREE downloads for y'all in the VERY near future!!! 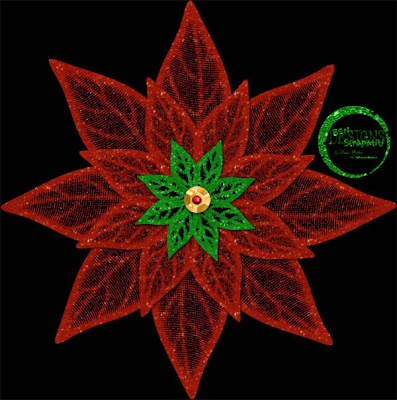 I am SO excited and I shall post MORE info as the time approaches so that you know where to go and what to do to collect this MEGA, MEGA, MEGA Christmas compilation! WOW! It is going to be HUGE!!! Oh ... and GORGEOUS! You won't wish to miss a single piece of it - I know I won't! I shall catch up with y'all on Sunday and, hopefully, will have something to add to "Color Me Christmas"!!! Oh, my mind is already going .... I'm sure I'll have a little something for you!!! Are y'all ready for Thanksgiving??? Looks like Robert and I will be celebrating as a couple this year. The boys are headed to meet up with their sisters at their uncle's in Medford, Oregon and Robert has to be to work EARLY Friday morning - poor babe. We have been invited to spend a nice intimate Thanksgiving with several of his siblings, but it would be six hours on the road plus the time there and he is exhausted just thinking about it!!! This will be a first, but ya know - it will be a NEW memory in the Walton/Posten family album!!! On the flip-side of spending Thanksgiving with "just the two of us", we are going to spend Christmas (gosh, oh golly, I am SO excited!!!) in Vancouver, Washington with my daughters, April and Joan!!! Joan was just recently engaged and it is time for us to meet our future SIL and his family! One of my designer colleagues at 3Scrapateers lives in Vancouver. I refer to Ms. Kimberly Stewart as my "designer queen" (she is AMAZING!) and I just can't wait to let her know that I will be VERY close to her and, hopefully, we can hug each other's neck briefly, share a bit about ourselves, snap some photos and then scrap all about it!!! WOO HOO Ms. Kimmi - VANCOUVER OR BUST!!! Have a SPECTACULAR Saturday and Sunday y'all! 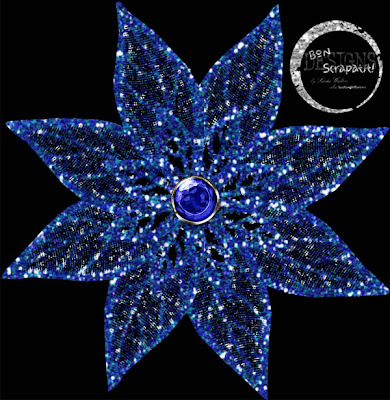 Just a REMINDER that TONIGHT is my SCRAP-A-DEAL chat at 3SCRAPATEERS and I'd LOVE to see y'all there!!! I TRULY enjoy my time in the chatroom with y'all just having a GOOD time and being our SCRAP, HAPPY selves!!! I've snagged a few GOODIES from Santa's bag (shhhh .... he'll NEVER know!) just to give y'all for coming tonight! If you can't make the chat and still wish to receive the FREE bonus add-on, CLICK HERE for all the info! Thank you for your continued support and HEARTWARMING and HUMOROUS comments - I just LOVE them! Y'all CRACK me up! CLICK IMAGE OR HERE TO PURCHASE FOR ONLY $2.00! 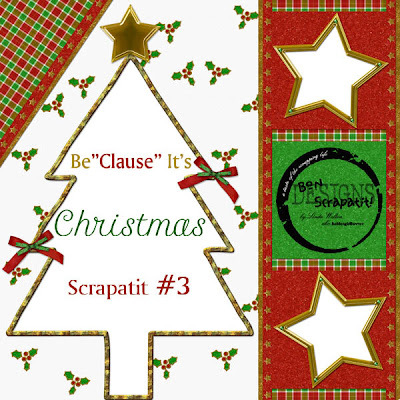 *BE'CLAUSE IT'S CHRISTMAS* SCRAPATIT #3 AND A HELLO FROM ME!!! G'day y'all!!! Yep, that's me .... mixing things up a bit!!! I cannot believe that I am STILL up, but was bound (well, not really, my hands are free but I think my backside is permanently adhered to my computer chair!) and determined to get this SCRAPATIT up before retiring for the night! I'm sure that some time ago (when I first started my blog the end of September), I had mentioned to y'all that I am a VERY slow scrapper and just about equally as slow a designer!!! Now mind you, I have had a time or two, perhaps three, that I've actually completed a project in a few hours, however, that is NOT the norm for me! I am ALMOST embarrassed to admit how much time I spent on SCRAPTIT #3! Hours! Why, when it looks SO basic? ROFL! Hey, you can pick on me - couldn't be ANY worse than me picking on myself now could it? LOL! Okay ... this is how Linda scraps: Visualize the artist who throws paint onto his/her canvas and dabbles in it for a while as he/she waits for inspiration! No, I am NOT kidding here! I will tell you that I TRULY admire those that can look at a photo, a color, an object, etc. and have the ENTIRE project figured out in a few moments! Oh my, that is DEFINITELY not mwau!!! I may have a basic idea, but usually will open a paper and and an element or two and begin to play. I may change them out right away or add or subtract from the equation several times before finally having a real visual of what is to come! While I do MORE designing than scrapping as of late, I have spent several days on ONE layout on MANY an occasion in the past! I usually teach myself something with each new project. I'll just start playing with a new filter, or blending modes, styles, etc. and find myself on a NEW adventure and TOTALLY distracted!!! This is my FAVORITE way of learning and I am pretty much self-taught in the majority of what I do. I do enjoy an occasional tutorial but, for the most part, I don't have time to get in too deep so I will just start messing around and try to figure it out for myself. I have also become VERY good at keeping notes, especially when designing. ROTFLMBO! Now, if any one can help me to come up with a GREAT way to organize the, soon-to-be, zillions of notebooks that I have, I shall be much obliged!!! Thank you to those who shared their part of the world with me! Tink, I shall be making a visit to your blog sometime tomorrow. You just know I miss reading your thought-provoking posts, enjoying the eye-candy in your layouts and seeing what you've been up to! I do believe from the sound of what you last posted here on my blog, your Scamp and our Joshua were in Fallujah during the same period of time. Joshua's first deployment was to Kuwait and then his second and third were both to Fallujah. We went to visit him in North Carolina upon his return from his first deployment to Fallujah, which was the very tail-end of September 2004. (I 'm thinking that he was only back in the US for a brief time and then returned but am a big fuzzy on that at the moment!) Josh's last deployment was from August 2005 to the end of March 2006. Josh exited the military in Feb/Mar of 2006. Sue, I have two brothers in Texas; one in San Angelo and one in San Antonio. I spent the majority of my senior year of high school in Grand Prarie (GO GOPHERS!) and returned to my native California to graduate. Now you know this was MANY moons ago! YEP, you ARE in Texas darlin'! Sarah, you and I are ALMOST neighbors!!! I live approximately and hour and a half southeast of you in the Mother Lode! I had a friend back in the 80's - 90's who bought a home in the VERY first subdivision built in Elk Grove! The only time I pass through is on our way to or from the Sacramento airport and we always stop in Elk Grove to fill our tank. I cannot believe how much it has grown over the past decade. Our little community is blossoming as well, though still rather small. CONGRATULATIONS on your bundle of joy-to-be! You are just a week or two behind my DIL who is due the third week of April. I hope you like SCRAPTIT #3. 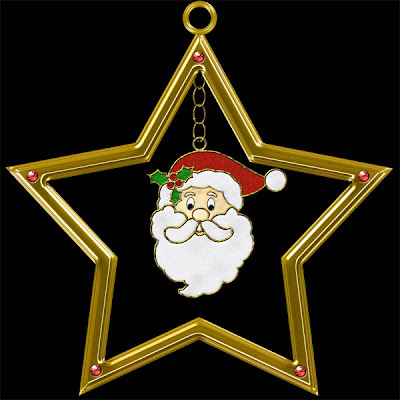 The tree and stars are ALL cutouts so that you can slide your photos in right behind the openings! Remember, when in Scrapland, it's ALWAYS "Scrap Happy Hour"! 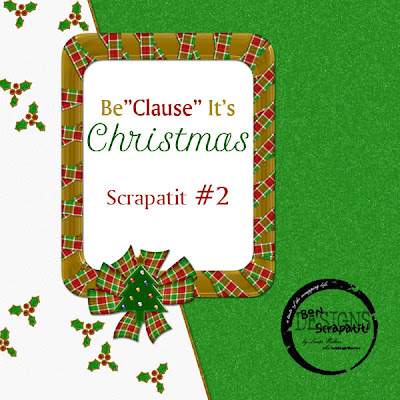 *BE"CLAUSE" IT'S CHRISTMAS* BONUS PREVIEW AND SCRAPATIT #2 - ANOTHER GIFT FOR YOU!!! HAPPY VETERAN'S DAY!!! My HEARTFELT thanks to ALL who have served, are currently serving and will soon be serving in a branch of our military. I did not have an opportunity to create a special tribute layout as I normally do each year, but if you look at the very bottom of my blog, you will find a few layouts in my slideshow of our Joshua while he was in Fallujah, Iraq as well as a WONDERFUL young man we met at Travis' wedding in June who was just getting ready for his first deployment to Iraq. I'm ALMOST caught up y'all!!! WOO HOOOOOOO!!!! Boy, does it feel GOOD! I have ONE more fairly good-sized project to tend to and then I should be cruising right along! How was YOUR weekend??? Rain, snow, humidity, wind? I'd LOVE to hear what's happening in YOUR part of the world! It rained ALL night last night. We needed it badly as California has been quite dry for a VERY long time and y'all know we just finished battling some BIG fires down south. We are allowed to burn on our property when it is a "burn day", however, since the fires in Southern California, we have been banned since October 22nd. Not sure when the ban will be lifted, but I'd rather know that we are all safe. We have had a fire burning in our wood stove the past two days as the temps have been rather cold with a bit of a wind chill factor figured in! I'm SO ready for winter as I just LOVE cool weather and the ability to "warm up" as opposed to trying to "cool down" during the summer!!! Okay, my age is showing now for sure!!! ROFL! Below, you will find a PREVIEW of the BONUS ADD-ON I promised to post for y'all! I've put all of the info below each image with links included. HAPPY MONDAY!!! (It's a wee bit past midnight here in PST!) Have a FUN-FILLED week y'all and remember, if you scrap, scrap HAPPY!!! 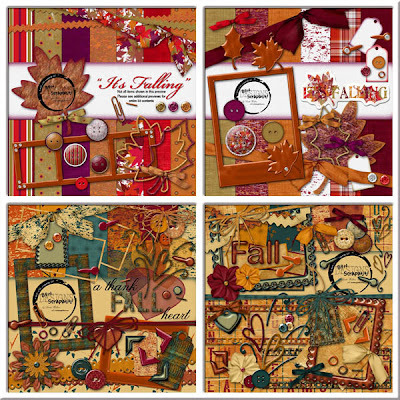 Here is a PREVIEW of the BONUS ADD-ON that can be yours for FREE when you purchase the Scrap-A-Deal scrapkit below for ONLY $2.00 HERE and post a layout to the gallery by Midnight, Thursday, November 15th. Oh and don't forget to attend the Scrap-A-Deal Chat on Wednesday, November 14th at 10:00 pm EST for some FUN and another AWESOME coordination FREEBIE!!! 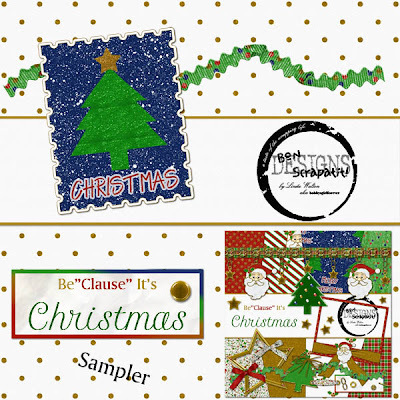 Santa tells me that you just might be able to use this freebie to post a letter to him! I look forward to seeing you there! 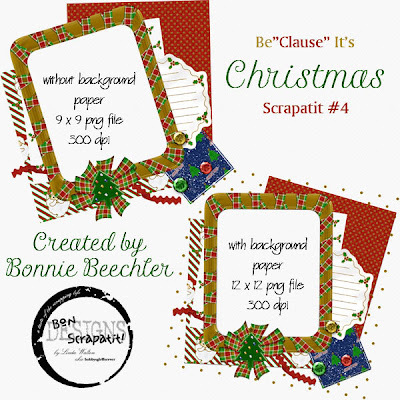 *Be"Clause" It's Christmas* Scrap-A-Deal Scrapkit available NOW through Midnight EST, Wednesday, November 14th for ONLY $2.00. CLICK HERE to find out how you can receive the BONUS ADD-ON for FREE! OMGosh! 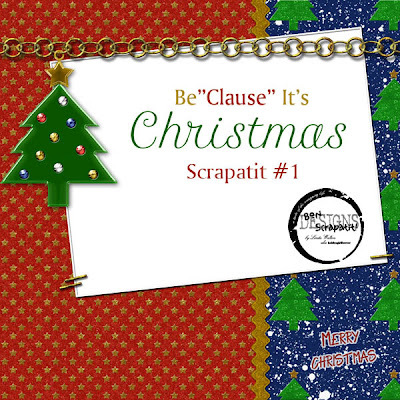 I've actually completed the ADD-ON kit to*Be"Clause" It's Christmas*, which will be given out as a FREE bonus for everyone who purchases the Scrap-A-Deal kit now on SALE for ONLY $2.00!!! For now, if you wish to see the FREE bonus add-on and how you will be able to receieve it, CLICK HERE for ALL of the DETAILS! I will try to get a preview posted here later on this weekend. I'm making this yet another "quick post and on my way to bed" night! LOL! Come Monday, I will be feeling MUCH more relaxed and rejuvenated as I will have pretty much caught up from my "down time" earlier this week. I am SO thrilled that you are liking my new Christmas kit SO far! I spent a good deal of time making my own background papers, which I do 99% of the time. GOSH, I have SOOOOO much to learn!!! I see some of the INCREDIBLE artistry showcased by MANY designers and I'm constantly latching onto a new mentor!!! ROFL! I'm always saying that, "I want to be just like so and so when I grow up"!!! I am TOTALLY in "awe" at what some are able to create! One step at a time, but I DEFINITELY know that PRESERVING MEMORIES is where I shall be focusing my time and energy for a VERY long time to come! All of those in agreement, raise your hands! Hear, hear! 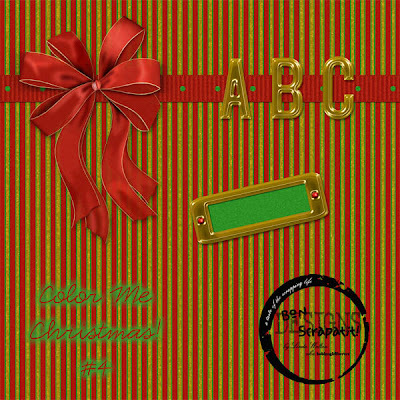 I wish to make an album from, *Be"Clause" It's Christmas* and I thought I'd start with the layout that I posted here several days ago. I just LOVE the EMBOSSED look to the red and gold star paper!!! I just want to reach out and rub my fingers across the stars!!! I hope y'all like it and can find a use for it. It would EVEN be cool for a Christmas card, don't you think? Just add your newest family photo and a sweet sentiment and you're good to go! Although my decorations are fairly minimal, I LOVE adding to the holiday ambiance several framed photos from family members who have visited Santa or attended a Christmas party. LOTS of FESTIVE options at Christmas time!!! I just happen to have one 8x8 frame left and am thinking of adding a nice family photo to this "scrapatit" to frame and display this holiday season. Oh what FUN .... LOL! Hmmm ... now I'm singing! Close your ears!!! I just LOVE this time of year. It is finally raining tonight and Robert started a fire in our wood stove this morning for the first time this season as it was below 40 degrees! Mmmmmm ... talk about ambiance! Have a SUPER SUNDAY everyone and Bon Scrapatit! WOO HOO!!! It's FRIDAY!!! I am tired and off to bed y'all so I shant bore you with my ramblings tonight!!! ROFL!!! 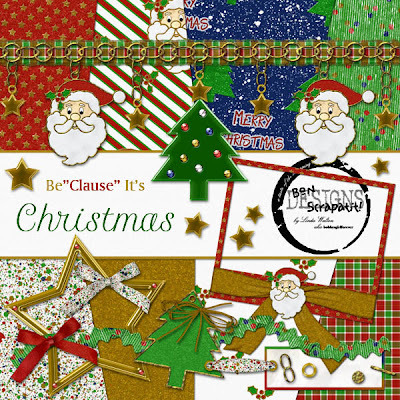 I have been working ALL day to complete my *Be"Clause" It's Christmas* kit and just did not have time to get a preview ready to post tonight, nor did I post in the forum ! I shall take care of all of that in the morning. I've been a bit of a ZOMBIE today. You know how it is when you are SO exhausted and even though you are working at something, it seems like you've accomplished next to nothing! Well, that would be me today!!! Off to bed, a GOOD night's sleep and looking forward to awaking REFRESHED and ready to grab the bull by the horns, or in my case, the computer by the mouse! LOL! Your FREEBIE tonight is a small sampler of my new scrapkit. You will find 1 - gold glitter dotted background paper, 1 - Christmas stamp, 1 - shiny gold brad, 1- patterned and folded rick-rack and 1 - journaling strip. Enjoy, SCRAP HAPPY and have a MAGNIFICENT weekend whatever you are or are not doing! I am going to try to sleep in ... he, he ... no matter how hard I try, I am usually up no later than sevenish. FREEBIE ALERT!!! COLOR ME CHRISTMAS #4 AND MY BIG UMBRELLA!!! I will have to catch up with y'all tomorrow night as I've had to bring out my BIG umbrella once again to shelter me from the HUGE storm of obstacles placed before me this past week!!! ROFL! I cannot tell you how THANKFUL I am to have a GREAT sense of humor and such a HUGE desire to live long enough to scrap ALL of my family's PRECIOUS memories so that I am learning how NOT to let stress affect my health as much I use to!!! First of all, my mama was admitted back into the hospital Monday morning. I had just spoken with her the night before and she was a bit concerned about numbness returning to her right arm and leg. My niece called from the hospital after admitting her to ER due to the fact that her face was also feeling numb. CT scan proved be normal. They thought that, perhaps, Mama might be having a series of mini-strokes. When I spoke with her earlier, she was still waiting to speak with the doctor. The hospital will be releasing her sometime tomorrow. Mama is still laughing and ready to get on with her life!!! I'm hoping and praying that they get her medications straightened out so that she is not feeling OVER medicated all the time and wanting to sleep. She does not like it one bit! We are also thought-consumed with some VERY odd behavior from the little guys (6 and 8). Not looking too good and we need to act on it fairly soon. We picked them up from their mom's to go with us to visit the grandbabies this past weekend. I will have to post some photos before the upcoming weekend. They are SO precious - both are VERY good boys and FULL of smiles!!! Last night (Monday), I thought I had lost one of my external hard drives and, of course, it would be the one that I am currently saving all of my photos, designs and such on! I was working in PS when all of a sudden I was unable to save my work. I kept getting a message that I was dealing with either hardware failure or network woes and to save somewhere else! EEEEEEKS!!! I am not networked so the only thing left was hardware failure! NO!!! Oh PLEASE, NO! I was SO tired and knew that I would not be able to deal with it with a clear and thought-producing mind, so I shut everything down and went straight to bed. I do not have sleep issues, thank God, so I got a VERY good night's sleep, however, I awoke a little earlier than usual and anxiety starting getting the best of me. This happens to me on occasion when I awake if I have heavy-duty stuff lingering from the day before. My way to get rid of it is to get myself out of bed rather than to try and continue sleeping. After sending Robert off to work, I pulled my computer apart, cleaned it thoroughly (WOW, it was quite dusty this time around), used canned air on all of the USB cords and cleaned extra well around ALL points of connection as the thought had crossed my mind that it might be a bad connection. Once I had everything back in place, I fired up the computer with no problem and then proceeded to fire up each of my two ED's. After the first one was finished transferring files, I turned on the second one and prayed that it would be A-OKAY!!! WOO HOOOOOOOO, all files were present once again. Thank you, thank you! Guess what I did for the rest of the day? BURN, BABY, BURN!!! Gosh, I feel SO much better knowing that ALL of my photos, scrapkits, commercial items and designs are now backed up!!! I had been dragging my heels on doing so as I'd removed my burning software due to some issues a while back and have not had the opportunity to re-install and get down to business. Well, I was given a WAKE UP call and I knew that I'd best heed to it!!! Now for another miracle - I must have my scrapkit finished and uploaded by tomorrow evening!!! I am thinking positively but something tells me I will most likely be running on adrenaline all day tomorrow!!! ROFL! I have A LOT of catching up to do and I am leaving y'all with another part to, "Color Me Christmas" and will still be adding more to it! The preview directly below is of ALL four parts offered on my blog thus far for any of you who may have not seen all of them out and about. If you are missing any of the four parts, just go back through my blog posts from the end of October to present to find the download links.